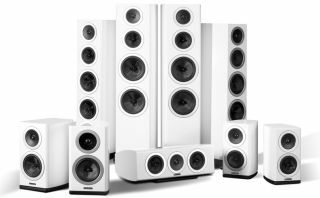 Wharfedale Reva speakers aim to double down on Diamond range | What Hi-Fi? Wharfedale has confirmed the release of a new speaker series called Reva. The range comprises two standmount speakers, two floorstanders and a centre channel, with the price of a stereo pair starting at £450. The Reva series, first teased at the Bristol Sound & Vision show in February, aims to build on the Award-winning success of the company's more affordable Diamond range, refining and upgrading the Diamond design in an effort to deliver better performance for a little more cash. While the Diamond 220 speakers come in at £220, the Revo 1 bookshelf speakers start the new range at £450. They're joined by the larger Reva 2 at £600, while the floostanding models, the Reva 3 and Reva 4, cost £1000 and £1300 respectively. The Reva C centre channel costs £400. So what's new? A fair bit, it seems. The cabinet construction, the drivers, the port design and the overall appearance of the speaker have all been upgraded for the Reva series, taking cues from the Diamond series along the way. Firstly, the sandwich construction of the cabinet, as seen on the Diamond series, has been improved thanks to additional layers. A strong structure complete with low resonance being the stated aim. Also revisited and refined from the Diamond range is the port design, which now sits at the base of the cabinet and claims to be more efficient. Deep, articulate bass should be the pay-off, even when positioned close to a wall. Wharfedale designs and manufactures its own drivers and cabinets in the same factory, and has tweaked its drivers to suit the new Reva cabinets. There's a new 'glass-fibre weave' for the bass and midrange drivers, while the 25mm tweeter sports a new fine-weave textile dome. Last but not least, the curved, one-piece cabinets are hand-finished with multiple layers of piano lacquer and matt-finished aluminium driver surrounds. Peter Comeau, director of acoustic design at Wharfedale’s parent company IAG, said: “The Reva project was a natural extension of the research we undertook when designing the Diamond 200 Series. We developed many effective techniques and technologies but could only take their implementation so far given the cost constraints imposed by Diamond’s low retail prices. The Reva series is due on sale in May, with a a choice of three finishes: piano black, piano white and deep rosewood. A walnut finish will follow in the summer.